A Sparrow I couldn’t ID. Maaaaybe a Savannah Sparrow?? Wish I’d had my camera. Would have gotten some great pics of the Bobolinks. I feel as though my life has been on a roller coaster for the last three weeks. Big downs, big ups, little downs, little ups. First big down: Hearing that our dear friend Laura had a brain aneurysm, and remains in a coma after successful brain surgery to clamp it off. Followed by a big up almost two weeks later: Seeing Laura open her eyes and looking at Marty and me, and squeezing our hands in response. Second big down: Getting rear-ended by a kid in a Passat on a downtown Denver street. Having to deal with all the crap afterwards, which is doubly painful because I didn’t cause this accident, yet I’m devoting my time and energy to heal my body and my car. It should be resolved by next week (I hope). A little down: Falling on a sidewalk last night after tripping over my own feet (although Marty started it by accidentally stepping on my foot). Having that what-the-hell-just-happened feeling, like how I felt after my car getting hit. Feeling sore, scraped, battered, and bruised. A little up: Feeling grateful for my family and friends. Maybe that should be another big up. Nothin like a new year to feel like you’re looking at a blank slate…even though you’re a sum of everything you’ve ever said and done. What a year 2010 was! 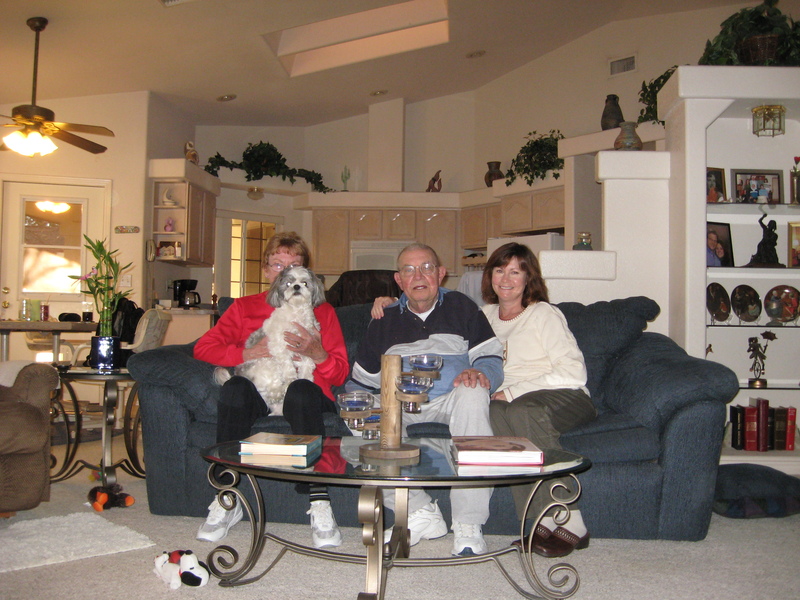 Mom, Max, Dad, and me…sans Marty! Had a relatively good holiday – if you don’t count the fact that my husband didn’t go with me to my parents’ house as planned! The night before our 7:35am flight from Denver to Las Vegas, we discovered that Star ripped his dewclaw nail. It had happened that day, but we didn’t notice until getting ready for bed around 9:00pm. It looked awful and he was in pain, so off to the emergency vet clinic we went. Had to wait; another dog was being treated for gunshot wounds. Around 11:30, they sedated him, clipped the nail (likening it to a really bad hangnail), and sent us home at midnight. Our instructions: take the bandage off the next morning, limit exercise, withhold food for several hours, and make him wear the cone (of shame) to prevent infection. We didn’t want to put the burden of Star’s care on our pet sitter, who had met him just the week before. So we decided that Marty would stay home and I would travel alone. The next morning, I called my parents from the airport and said, “Now don’t freak out, but Marty’s not coming.” I explained, and hung up. Minutes later, my mom called to say that I didn’t have to come if I didn’t want to; they’d completely understand. I said no, too late, I was on my way. Or at least, my bag was on its way to Vegas whether I accompanied it or not. I never thought about his confirmed seat on the Southwest flight. I boarded and, as usual, sat as close to the front of the plane without sitting in the bulkhead. I was in the second row. Just before we left, the gate agent came running onto the plane and said my husband’s name and instructed him to press the call button immediately. I leaned out of my seat and said, “I’m his wife – he wasn’t able to make the flight”, and apologized for not saying anything when I checked my bag. No big deal; the gate agent left, and the flight attendant secured the door. She turned to me and said something like, “I’m so sorry he couldn’t make it.” Rather than go into the long story, I quipped, “Well, you know how it is…after 20 years of marriage, sometimes you need a break from each other, even on a holiday.” That got big laughs. Even though we missed Marty, I was so glad that we made this decision. Star was fine; he’s healing and didn’t have to wear the cone for very long. Marty celebrated Thanksgiving at my brother’s house, and a good time was had by all. When I checked in for the return flight, I made sure to tell the reps that he wasn’t aboard, and they could resell his seat. Glad I did that; it was a completely full flight. Now I see, firsthand, why airlines oversell flights, because the odds are good that not everyone who buys a ticket will travel.